Suitable for 1 oz Canadian Gold Maple Leaf Beautiful transparent plastic cases to protect your coins from scratches and tarnish. These cases feature an air tight seal and a flat surface suitable for stacking. 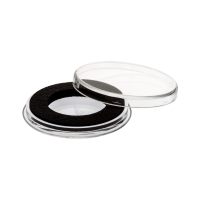 This coin capsule comes with a black foam ring which keeps the coin fit in the case. كبسولة عملة ل 1 أوقية عملة ذهبية Suitable for 1 oz Canadian Gold Maple Leaf Beautiful transparent plastic cases to protect your coins from scratches and tarnish. These cases feature an air tight seal and a flat surface suitable for stacking.